we have discarded imitation, the lifelike depicting of nature. via abstract forming we found our way to applying the concrete and the reality of the physical substance of the paint. the sensual arousal of the painter is needed. awakening the dionysian, awakening the unconscious detects, as a seismograph does quakes, the organic excess of creation. the bite of the predator is demanded from the painter. the intensive experience of the dionysian is destruction and creation simultaneously. like the big bang, the mythical lacerating situation of the god dionysius, like the fundamental excess shown in the mythical leitmotif of the o.m. theatre. the pencil of the child seeks to scribble, things sanctified by civilisation are scribbled on in some way, defiled. something one can write and draw with is used in its most fundamental form. something rubs off, dirties, smudges, a cosmic innocence attempts (unthinkingly) to tentatively leave traces. this can also be done aggressively. the scribbled on is impure, tainted. repressed restrained instinctual needs make themselves visible. acts like the forbidden smearing of excrement, the eruption into scribbling soiling (yet to be even recognized as such), emerge. the primeval form of the creative, not only artistically, happens. the cosmic creative act, realizing what is alive and vital, is performed. the impulse takes place that brings forth suns and gives birth to galaxies, that makes cosmoses balance out and, in the sense of the eternal recurrence, disappear again. 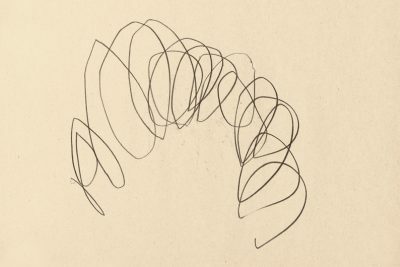 my scribbling tries to penetrate deep into being, into the groundless (without beginning and end), into the fundamental excess. a total, extensive automatism is applied. the situation of the drives of the unconscious expresses its quakes and shudders through gestures. i thank arnulf rainer for the spark of inspiration, his TRR manifesto published in the 1950s left an indelible impression. his radical turn away from all traditional painting led him to buddhist fields of thinking. his central forms and blind painting stimulated me to undertake my first scribble drawings in the 1960s. drawings by apes have influenced me. here the unconditional absence of art is presupposed for the moment. 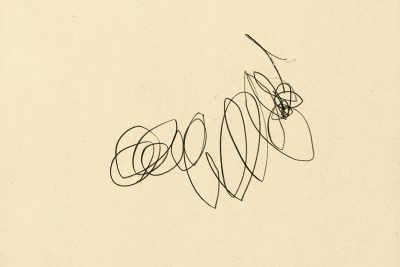 here an animal tries to scribble. a (culturally blind) groping towards something that is open, into a vacuum, into an abyss. a pencil, a crayon blots something, the animal is wrenching to draw something, and something happens. the animality is perhaps even forced into seeking to do something that we are not aware of. the animal is confronted with something that has no effect. like two galleries which are to join up to form a tunnel, but fail to meet. perhaps the ape is trying something with his drawing that remains shut off from us. 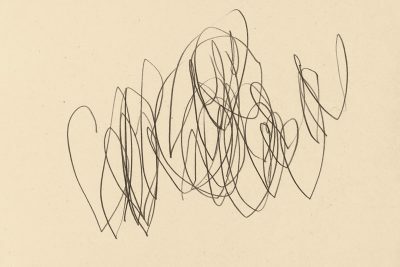 perhaps concealed behind the mysterious scribble is the beginning of art that all are unconscious of. perhaps the animal is beginning something that overcomes and leads us somewhere else.